"Trees stay outside one's thought"
"Creeley never forgets the singular modernist American poets who are no longer here to speak for themselves: Stein, Hart Crane, H.D., Pound, Williams, Olson, Niedecker, Zukofsky, and dearly and recently Robert Duncan did and do believe with passion that poetry is that most really charged with meaning. Reading to write and writing to mean so much, Howe’s allegories of poetic production demonstrate an emotive metabolic thought-body can not help but become involved in our work as scholars and critics. 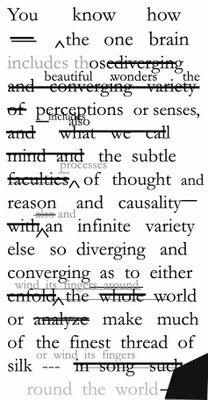 This thought-body looks for meaning through a profound exploration of textual production as origins are both obscured and inhere in editorial geneologies. Evolutionary Love (Peirce) at first sight? Through what Pierre Klossowski calls “felt necessity” in his own loving work for Frederick Nietzsche’s embodied philosophy—*The Vicious Circle*—the poet-scholar re-enacts beloved authors becoming them as they become us. Every name in history is I (Nietzsche). To Howe’s work I owe a sense that poetry itself is a lived theater in or of historical traces, resonances, erasures. That the page is a stage where “I” speaks history’s singularities and intensities; that “every name in history is I” because I is pervaded by others; and that this enunciation through the noise of history official and rumored, occulted and eclipsed is not representative but FELT. To feel intensely the work of another at one’s self, to pronounce the energetic phase states of historicity as such, is a way of becoming historically eccentric—the decentered enthusiastical circles to which Nietzsche, Emerson and Stevens refer and undergo in their compositions. This sense of Howe’s pages as theatrical seems one of the least examined aspects of her work despite Howe’s numerous allusions to the theater, the pervasiveness of Shakespeare who founds Howe’s reading of Dickinson along with the Brontes, Charles Dickens, George Eliot and Robert Browning, and the fact that Howe’s mother, Mary Manning, was passionately involved in the theater. In the theater we go down to rise, we become the thing we aren’t, we put on faces of power and disempowerment. And in doing so assume intensities individuated among multiplicity’s related whole. Mirror-mazes’ morphogenesis meaning production. These moments, as Howe herself insists, are moments of sea-change, contradiction, and powerful transference. Fortuitous chances arising from compulsions of effort and risk they broach a pragmatical mystical truth: that the self is always an other, the subject an object, that in a field of relations all meanings have a point of transformation where each pass through their opposite, and momentarily neutralize opposition itself. A point of indiscernibility. A sensory-motor movement of the soul becoming actual present upon the page in historical appearance. Poetry is the great reinforcement of life. In bifurcations we go down, enacting, reenacting. Time is not wasted in these temples. In the elective emotionality of Firstness—a perceptive thought-form Gilles Deleuze associates with the close-up of faces in cinema, and calls “Affect-Image”—Howe may also work as a poet-filmmaker. I am sorry I was not around for Howe’s 1995 class on Documentary cinema and poetry. At the time she was teaching the seminar I was busy discovering French and Russian cinema on my own through the filmmakers she addresses in her under-read essay on cinema, “Sorting Facts”: Chris Marker, Dziga Vertov, Jean-Luc Godard, Sergei Eisenstein, Andrei Tarkovsky. * Through play with the features of book-making (her Burning Deck edition of *A Bibliography of the King’s Book Or, Eikon Basilike* and collaboration with Coracle Press, *Kidnapped*). In *Kidnapped*, and *The Midnight*, I hark back to Howe’s wonderful inclusion of a photo-reproduction of the fly-leaf protecting illustrated pages, and separting them from the non-illustrated pages apposite them (like veils, or stage curtains). *The Midnight* also provokes me to make comparison between the spiraling horizontal factual forms of W.G. Sebald’s work, and Howe’s own recent autobiographical-mnemonic compositions. Where some have criticized Howe’s recent work in autobiography/memoir as a retreat from her earlier work (see Leslie Scalapino's comment in *Syntactical Impermanence*) I see this development as a logical (if not inevitable) trajectory, insofar as it extends a virtual bifurcation already present in the work. Only now that work is turned more inwardly, convoluting personal memory (or history) over (public) historical/diachronic exteriorities. * Through audio experiment (her recent collaboration with David Grubbs, *Thiefth*), and in her “doing the voices” of her poems: in whispers, shouts, speech, song, silence. Virtuosic modalities. This list is obviously inadequate, and is not meant by any means to be an exhaustive taxonomy of Howe’s techniques as a poet. Yet I would add among these correlated qualities and tactics Howe’s singular ability to juxtapose two or more texts, allowing them to resonate, conflict, contradict, talk, or substitute with each other. This paratactical design I also observe in Louis Zukofsky’s *Bottom* and his masters thesis on Henry Adams where Zukofsky’s obliquely condensed expositions often precede or follow directly on a little-introduced and exposited citation, and Chris Marker’s film-“essay” Sans Soleil, where, as Raymond Bellour has written of the film, image and text “slide” under and over each other in (doubly) helixical verticalities, “hyperlinking” long before CD-Rom or the Internet were in use. 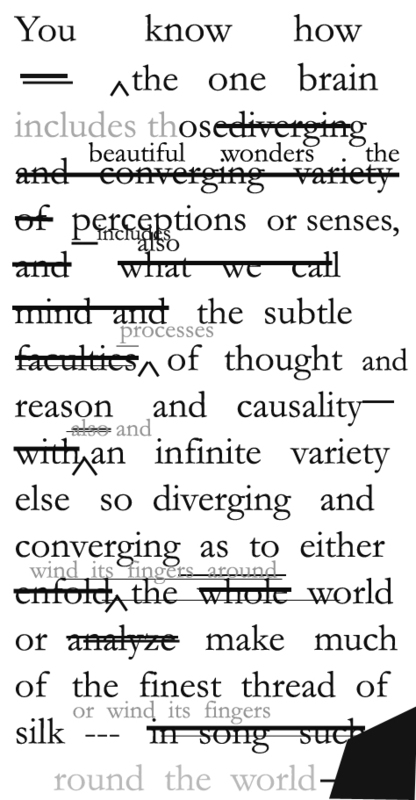 Howe’s is a “sliding” scholarship, but also the scholarship of a hermeneutist uniquely capable of producing maximal meaning by radical arrangements and minimal exposition of texts. Learn to feel against yourself. "Your head's bashed in darling. Look out!"